An emblematic print with hidden portraits of the Presidents, from Washington through Jackson. 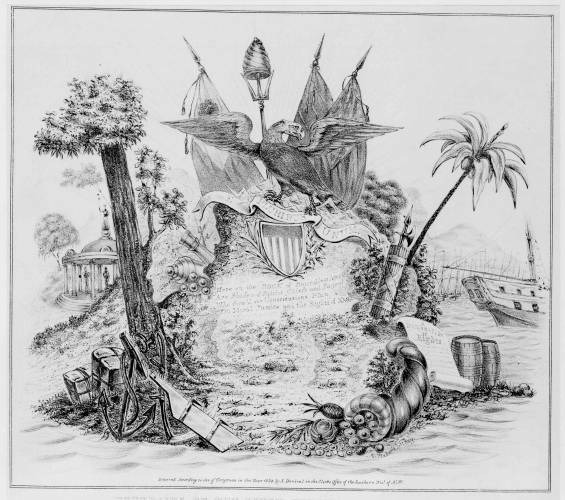 In the center is a small land mass, surrounded on three sides by water and strewn with barrels, anchors, bales, a cornucopia, rudder, scythe, fasces, cannon, and a scroll "Declaration of Rights." On the left is a deciduous tree of indeterminate species, and on the right a palm tree. In the center an eagle holding lightning bolts stands over a shield with palm and olive branches, and a banderole with the words "E Pluribus Unum." Are Shades of Patriot Chiefs and Sages! On Moral Justice and the Rights of Man. Behind the eagle is a trident surmounted by a beehive-like liberty cap and three flags. Rays of light emanate from behind. In the left background is a peristyle Temple of Liberty, on the right are several ships on the water. The portrait profiles are visible in the central portion of the image.